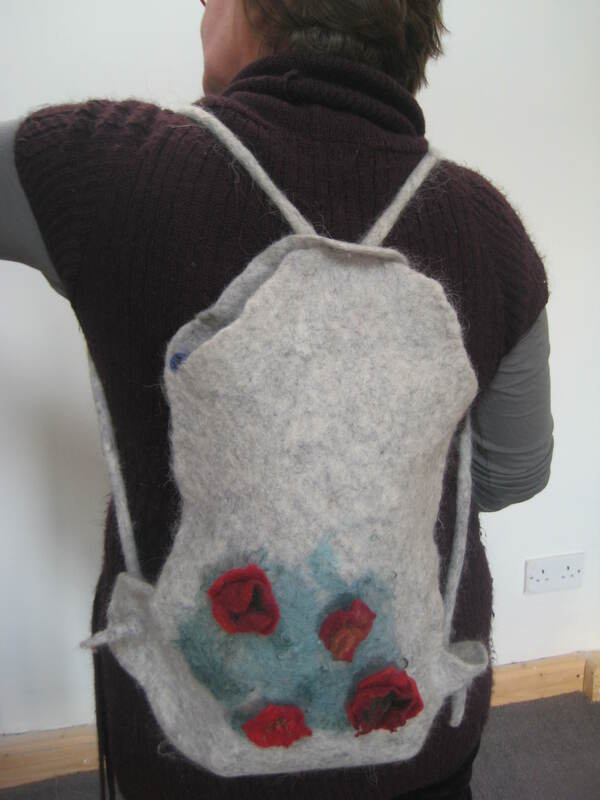 A group from Feltmakers Ireland spent last Saturday felting together in the Social Club in Inchicore. It is a great venue, it was originally the Railway workers social club in Inchicore Square and is now a community centre. We were made very welcome and the hall is ideal for feltmaking – lots of light, space and big tables. I made a lovely rucksack style bag based on a design by Leiko Uchiyama. Leiko was in Dublin over the New Year and I was very jealous of her bag and decided to make one for myself. I used some Norwegian C1 wool fibre, and created a “bed” of green Wensleydale and “planted” some 3D red merino roses (inspired by Lulu Guinness). We hope to hold these day long working days regularly. If anyone is interested in taking part please let me know – sheila.ahern@ireland.com. The days are very informal, everyone works on their own but it’s great working with other people and you can learn a lot just by seeing what everyone is doing.